The Mildura Motorcycle Club was formed in June of 1947 and looked after many codes of motorcycle racing in the Mildura district. Speed events have been keenly appreciated throughout the Mildura Motorcycle Clubs history. Member Max Robinson built an electronic timing device which was used occasionally when flying quarter, half and one mile events were held either on the Sturt Highway, out towards Lake Cullulleraine, or on the dry bed of Fletchers Lake, North of Dareton. The Dareton events were used as a fund raiser for the new Coomealla Memorial Club. 1950's - Photo's: Brad Leersen. 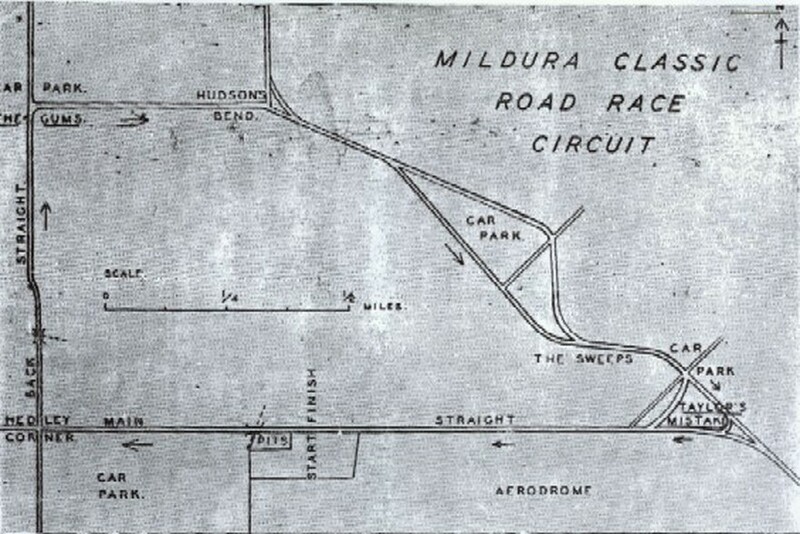 The Mildura TT Circuit was a motor racing street circuit that was used for motorcycle road racing events in 1954, 1955 and 1956. 1955 - The sign says it all. Photo: Brian Caldersmith. 1955 - British rider Dickie Dale on the works Moto Guzzi on the main straight at Mildura. Photo: unknown.